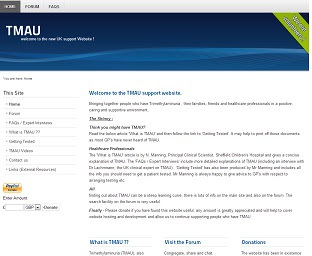 TMAU.ORG.UK has been serving the TMAU community since 2009 with their website and forum, which includes inspirational stories, interviews with experts, press releases/interviews, videos, and general TMAU tips. As a member of this group, I have received an email from The TMAU Forum Management notifying us of a survey sufferers who have tested positive for TMAU are invited to participate in. I have copied and pasted below the information The Management has sent me with the links exactly as they noted. All persons with TMAU are encouraged to assist in this survey. patients with TMAU. Could you kindly supply the following information? • Have you ever been diagnosed with heart disease? If yes, at what age? • Have you ever smoked? will be confidential. No names will be published. Thank you for your help.